Roland Barthes, whose centenary falls in 2015, was a restless, protean thinker. A constant innovator, often as a daring smuggler of ideas from one discipline to another, he first gained an audience with his pithy essays on mass culture and then went on to produce some of the most suggestive and stimulating cultural criticism of the late twentieth century, including Empire of Signs, The Pleasure of the Text, and Camera Lucida. In 1976, this one time structuralist outsider was elected to a chair at France's preeminent College de France, where he chose to style himself as professor of literary semiology until his death in 1980. The greater part of Barthes's published writings have been available to a French audience since 2002, but here, translator Chris Turner presents a collection of essays, interviews, prefaces, book reviews, and other journalistic material for the first time in English. 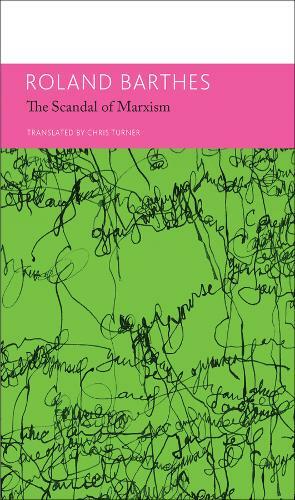 Divided into five themed volumes, readers are presented in volume two, 'The "Scandal" of Marxism' and Other Writings on Politics, with a wide range of Barthes's more overtly political writings, with an emphasis on his early work and the serious national turbulence in the French 1950s.